Recently at the Culinary Literacy Center, Bruce Schimmel, founder of the Philadelphia City Paper and community chef, taught a class on Israeli salads and their perfect pairing—pita bread! With just a few ingredients you can make this traditional Mediterranean flat bread at home and pair it with a warming dish of chickpea and cauliflower curry. Be sure to check out future classes with Chef Schimmel in 2016 at the Free Library’s Culinary Literacy Center. Mix the water and yeast together and let sit for about 5 minutes, until the yeast is dissolved. Add 2½ cups of the flour (saving the last half cup for kneading), salt, and olive oil (if using). Stir until a shaggy dough is formed. Sprinkle a little of the extra flour onto your clean work surface and turn out the dough. Knead the dough for about 5-7 minutes, until the dough is smooth and elastic. Add more flour as needed to keep the dough from sticking to your hands or to the work surface, but try to be sparing. Clean the mixing bowl and film it with a little olive oil. Set the dough in the bowl, turning to coat it with the oil. Cover the bowl with a clean dishcloth or plastic wrap and let the dough rise until it’s doubled in bulk, 1-2 hours. Gently deflate the dough and turn it onto a lightly floured work surface. Divide the dough into 8 equal pieces and gently flatten into each piece into a thick disc. Sprinkle the pieces with a little more flour and cover with a towel or plastic wrap until you’re ready to bake them. Using a floured rolling pin, roll one of the pieces into an 8-9 inch circle about ¼-inch thick, turning and flipping the dough frequently so the dough doesn’t stick to your work surface (sprinkle the surface with more flour as needed to help with sticking). While shaping the pitas, heat the oven to 450° and place a baking stone or baking sheet in the oven to heat. Place the rolled out pitas directly on the baking stone or sheet and bake for about 3 minutes. 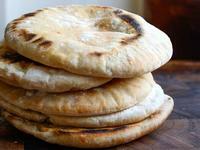 The pita should start to puff up after a minute or two and is done when fully ballooned. Warm a cast-iron skillet over the medium-high heat until a few beads of water sizzle immediately on contact. Drizzle a little oil in the pan to coat and wipe off any excess. Flip and cook for 1-2 minutes on the other side, until large toasted spots appear on the underside. Flip again and cook another 1-2 minutes to toast the other side. The pita should start to puff up during this time; if it doesn’t or if only small pockets form, try pressing the surface of the pita gently with a clean towel. Keep cooked pitas covered with a clean dishtowel while cooking any remaining pitas. Try your hand at making your own delicious pita bread.